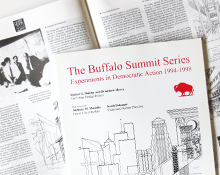 The Buffalo Summit Series was predicated on the idea that public conversations, carefully structured and faithfully reported, could lead to improved public judgment and accountable action. This volume provides a detailed record and analysis of five years of public engagement involving thousands of Buffalonians considering how to improve their neighborhoods and their downtown. This entry was posted on October 31, 2014 .